Giving compelling answers to interview questions can make the difference between winning a job and unemployment. 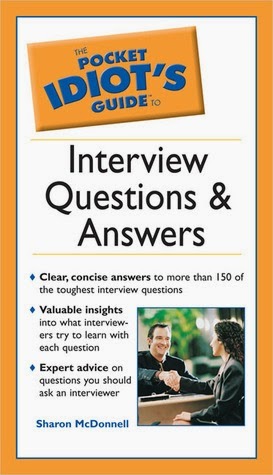 The Pocket Idiot's Guide to Interview Questions and Answers will arm you with answers to the 150 toughest interview questions. Whether you read the book cover-to- cover to prepare for an initial interview or uses it as a last-minute reference on the way to a final interview, you will be prepared to offer clear, concise, and thoughtful answers. You'll also learn what questions to ask your interviewer to help you figure out if the job is right for you. Pocket size gives you easy-to-access information to prepare for an interview Helps you understand what information interviewers are really trying to uncover with their questions. Thanks to Overdrive, I found this very handy little guide to help me prepare for job interviews. After 21 years working in the same company, I was a little anxious and lacking in confidence. The last time I actively searched for jobs, there was no internet. I remember using the newspaper, talking to friends (did the word “networking” even exist in those days? ), applying to companies in person, or taking temporary jobs in the hope they would eventually become full time. This book is very easy to understand and searching for information is a breeze. There is a table of contents and an index. If you need a quick overview on a specific topic, each chapter has a summary at the end. There is also a glossary with relevant terms covered in the book and various online resources for job hunting, links to business journals, career coaching, salaries for numerous industries, non-profit careers, trade associations, and even a site that contains listings for “fun” jobs (CoolWorks.com). After reading, and with the help of additional information I found online, I felt a lot more confident by the time I went on my first interview and think it may have even helped me get my current job. This is a very useful resource that I would highly recommend to those in the job market.